What would happen to you and your family if you became ill or incurred an injury that prevented you from working? Although it may be unpleasant to think about such misfortune, preparing for disaster before it strikes can make a positive difference in your life. Advanced American Financial works with individuals and families in your neighborhood to protect your family and your assets in the event of a health crisis or similar tragedy. According to the Bureau of Labor Statistics, only 17.6 percent of disabled individuals were employed in 2013. Unemployment rates for disabled individuals actively seeking employment were 13.2 percent as compared to only 7.1 percent for those with no disability. Among employed individuals, 34 percent of disabled workers worked part-time jobs as compared to only 19 percent of those without a disability. (Source: bls.gov/news.release/disabl) Before retirement, over 40 percent of people will become disabled for at least 90 days. In the face of such statistics, can you afford to live without disability insurance? There are many different types of disability insurance available. You might be able to purchase minimum coverage through your employer. 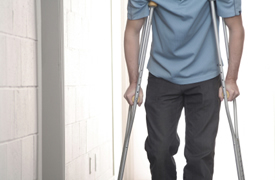 If injured on the job, you would be able to make a workers’ compensation claim. However, these options might not cover you in the event of certain disabilities, and they may not be enough to pay the bills and feed your family if you become disabled. Disability income insurance is a primary income replacement plan that pays monthly income in the event that you are unable to work due to a covered injury or illness. Mortgage disability income insurance protects your home by providing mortgage payments should you become completely disabled. Individual credit disability insurance helps with loan repayment in the event that you are totally disabled. Contact us today to learn more about available disability insurance options. We look forward to helping you protect your future.